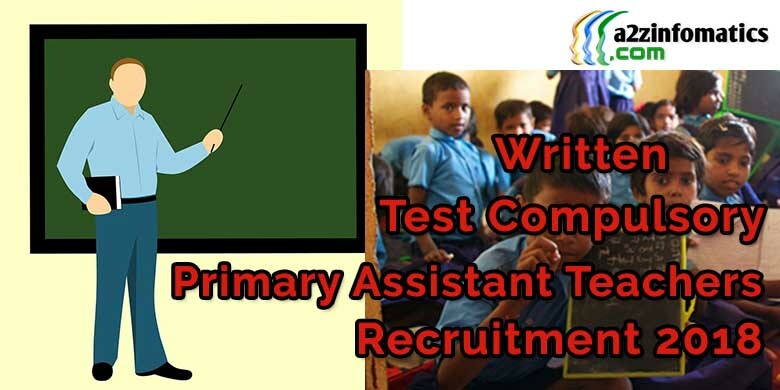 Written Test Compulsory for UP 68500 Primary Assistant Teachers Vacancy / Recruitment 2018. UP 68500 Basic Primary Assistant Teachers Recruitment 2018 / Selection Process. Compulsory Written Exam (Total 150 Marks). Mandatory to pass the examination by 45% (for GEN & OBC candidates) and 40% (for SC and ST candidates). Final Document Verification of the eligible aspirants. Allotment Confirmation Letter (in accordance to choice or priority). Most of the Eligible TET candidates were eagerly waiting for the exam date to get announced for the adhyapak bharti 2018. Securing good marks in the compulsory UP Basic Primary Assistant Teacher Recruitment exam will surely boost the chances of getting govt teacher job. In the coming sections, we are going to showcase the proposed syllabus and exam pattern for the UP Primary Teachers Recruitment Exam 2018. UP 68500 Primary School Teachers Recruitment Exam 2018 Registration Online Form. Registration is likely to start from 22 January 2018. Once the Official UP Primary Teacher Recruitment 2018 Online Registration begin, the online registration / form link details will be updated accordingly. Keep visiting and bookmark this page for any future reference. UP 68500 Assistant Teacher Vacancy / Recruitment 2018 Important Dates. UP 68500 Primary Teachers Recruitment Online Form / Registration start date: 25 January 2018. UP 68500 Primary Teachers Recruitment Online Form / Registration end date: 6 February 2018. UP 68500 Primary Teachers Recruitment Online Form / Registration correction date: to be announced. UP 68500 Primary Teachers Recruitment Admit Card download start date: to be announced. UP 68500 Primary Teachers Recruitment Result date: to be announced. Important: UP 68500 Assistant Shikshak Bharti / Teacher Vacancy Official Notification 2018 is likely to arrive on 22 January 2018. UP 68500 Basic Primary Assistant Teachers Recruitment 2018 Examination Pattern. The written examination will be conducted Offline, with no objective type questions. This time the up teachers recruitment examination will be of subjective type, with very short answers for the questions asked. Although there is no official announcement about the time duration for the UP Teacher Recruitment Exam, but some reputed sources had confirmed that the exam would be of 03 hours (180 minutes). Language (Hindi-हिंदी & English-अंग्रेजी) – 40 Questions (short answer). Mathematics (गणित) – 20 Questions (short answer). Science (विज्ञान): 10 Questions (short answer). Environment & Social Studies (पर्यावरण एवं सामाजिक अध्ययन) – 10 Questions (short answer). Teaching Skill (शिक्षण कौशल): 10 Questions (short answer). Child Psychology (बाल मनोविज्ञान): 10 Questions (short answer). General Knowledge (सामान्य ज्ञान) and Current Affairs (समसामयिक घटनाएं): 10 Questions (short answer). Reasoning / Logical Knowledge (तार्किक ज्ञान): 05 Questions (short answer). Information Technology (सूचना तकनिकी): 05 Questions (short answer). Life Skills (जीवन कौशल) / Management and Accession (प्रबंधन एवं अभिवृद्धि): 10 Questions (short answer). Note: Allotted Duration for UP Primary Teacher Compulsory Exam is 180 Minutes. Subject-Wise Distribution of Marks for UP 68500 Teachers Recruitment / Adhyapak Bharti Compulsory Written Examination. Language (Hindi-हिंदी & English-अंग्रेजी) – 40 Marks. Mathematics (गणित) – 20 Marks. Environment & Social Studies (पर्यावरण एवं सामाजिक अध्ययन) – 10 Marks. Teaching Skill (शिक्षण कौशल): 10 Marks. Child Psychology (बाल मनोविज्ञान): 10 Marks. General Knowledge (सामान्य ज्ञान) and Current Affairs (समसामयिक घटनाएं): 10 Marks. Reasoning / Logical Knowledge (तार्किक ज्ञान): 5 Marks. Information Technology (सूचना तकनिकी): 5 Marks. Life Skills (जीवन कौशल) / Management and Accession (प्रबंधन एवं अभिवृद्धि): 10 Marks. Note: Passing certificate will be issued to all passed candidates within one month of the UP basic primary assistant teacher recruitment examination. That’s all we have related to the UP 68500 Primary Teachers Recruitment Exam, we are in process to release many more free job alert for our reader. Keep visiting a2z infomatics, subscribe now to remain updated with the latest recruitment / employment news.